We are in for a dynamic and radical Full Moon (at 7 degrees 22 minutes of Aries), on this Saturday, September 29th (at 8:19 pm, Pacific Daylight Time). If you notice that you are feeling emotionally edgy (or unstable) and reactive to your friends and family, you are not alone! The Universe is stimulating us to move any stuck emotional energy that we are holding on to. Two of the most dynamic and dangerous emotions that may emerge are frustration and anger. At the root of these emotions may be a feeling that your individuality, freedom or independence is being threatened. 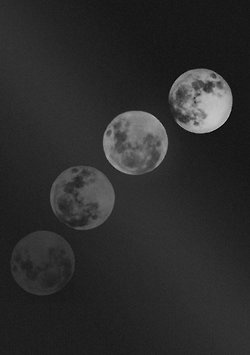 This Full Moon in Aries is being intensified by the interactions of the Sun and Moon with the Uranus/Pluto Square Aspect, creating a T-Square configuration. This energy is stimulating a purging of our unresolved emotional issues. Be sure to process any difficult emotions. Because both the Moon and Venus are in Fire Signs (Moon in Aries and Venus in Leo), life can get pretty intense and dramatic! You can take charge of and re-direct these energies through humor and philosophy. It is especially important, during the Full Moon day and the few days before and after the Full Moon, to get focused and centered in Spirit, before you have any interaction with others. Remember that a part of our personal mastery is to be the witness of our own human nature. Instead of reacting to people and circumstances, it is better to respond to life experiences from our center. A second T-square configuration, involving the planets Venus, Jupiter, Chiron and Neptune, may reveal hidden agendas and illusions in our relationships. Matters to do with resources and finances will require extra sensitivity and clarity. A Conjunction Aspect of the planets Mercury and Saturn (both in the sign of Libra), could cause us to be more critical and judgmental in our thinking. If you find yourself doing this, use this same energy to consciously change your focus of attention to something positive. Happy Full Moon to you all. I am so exhausted from all the work on the house that I didn't have the time or energy to write a Full Moon post myself. So this info is via this wonderful source. What a spectacular photo - I always kind of adore full moons. Maybe because living in the city we can't see any stars, so the moon is the closest to space we really get? Anni - yes, i feel the same way in LA, where only 2 stars are visible. i know millions of them are there, waiting to be seen, i love when i drive out to the desert and they reveal themselves!